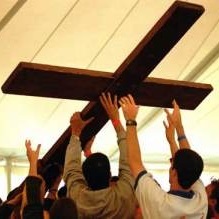 At the beginning of 2005, to publicise Pope Benedict XVI's first World Youth Day, 60 young members of the Catholic Kolping Society toted an icon of the Virgin and a four-metre-high wooden cross into the German Bundestag (parliament). Then they were off with it once more to find another photo-op in Auschwitz. The Kolping Society hailed the peregrinations of this large piece of wood as a "spiritual preparation" for their World Youth Day and they were indignant that the EU declined to fund it. Their executive found it "incomprehensible" that most EU politicians voted against the million-pound subsidy. They charged them with "acting from ulterior motives against the Catholic Church". The Pope has repeatedly warned of the dangers of "Christianophobia". A refusal to give public money to the Church would seem to be symptomatic of this disorder and the Kolping executive were indignant at "the purposeful rejection" of this mass gathering of Catholics. They announced that, having failed to win the subsidy by democratic means, they would lobby the European Commission, headed by the Vatican-friendly Barroso to get the European Parliament to change its mind. Sure enough, on 2 February 2005 the European Parliament put in a "request" to Barroso's Commission to grant € 1,5 million to the organisation of the World Youth Day, after all. It was suddenly discovered that this gather ing under Church auspices of some young Catholics (gay ones are not welcome) was "an important intercultural and non-formal learning experience". This prompted a protest by the EU's "All-party working group on the separation of religion and politics" which attempted to find out from the EU's Budget Central Control Committee what on earth the criteria had been for making this grant. The event itself was attended in his official capacity by the European Commissioner in charge of Youth, Ján Figel', who has been criticised for "not distancing himself from the Conservative Christian position as the only cultural tradition." There he appealed to the young Catholics "to engage themselves actively in society". Could he possibly have meant "politics", and maybe even politics of a particular direction? At the request of the European Parliament, which voted a resolution in February 2005, the Commission has granted € 1,5 million to the organisation of the World Youth Day which is taking place in Cologne this week. This grant is allocated from the EU budget line “Special Annual Events”. The Community support for the World Youth Day is geared towards elements which correspond to the European Union's values and focus on solidarity and active citizenship. These elements are represented in the overall programme of the World Youth Day, leading to a major intercultural and non-formal learning experience for the young participants. Concretely, the requested grant of € 1,5 million serves to co-finance with up to 80% the logistics, food and accommodation for approx. 20,000 short-term volunteers helping with the implementation of the World Youth Day. The perspective of this Community support has led the organisers to take special care for the European profile of the event and to introduce a “tsunami dimension” in the official programme as requested by the EP resolution of 24 February 2005. Finally, under the regular selection procedure of the EU YOUTH programme the Commission has granted a collective European Voluntary Service with 100 volunteers between 18-25 years. The grant amounts to € 250,000.The project title is “EVS - Weltjugendtag 2005” and lasts from 1 April - 30 September 2005 and involves 26 sending organisations from 20 European countries. This project is intended to help making World Youth Day even more visible as a significant European event and to provide an important intercultural and non-formal learning experience. European Commissioner in charge of Youth, Ján Figel' will visit the participants in this project and will attend some of the events to be held in Cologne.